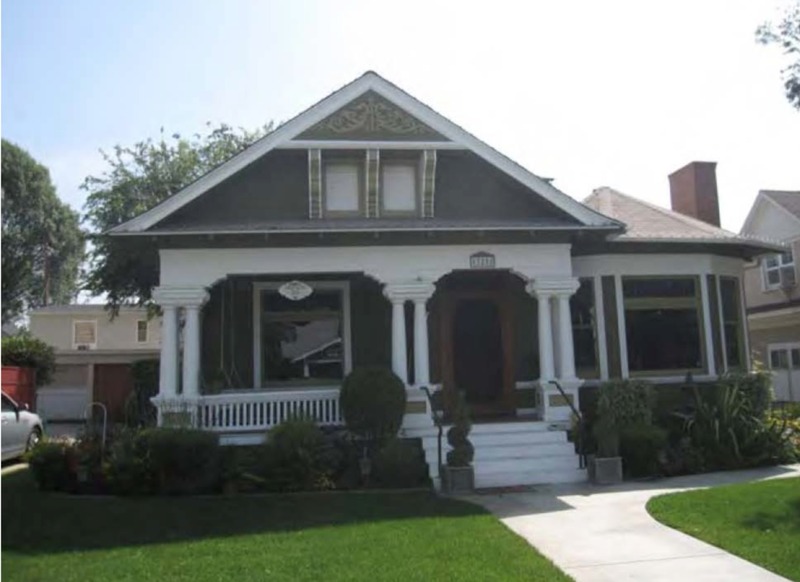 13218 Hadley Street was built in 1903 by contractor, A. McBarnes. This residence was constructed for Charles L. Keiser, a Fidelity Oil Company employee and rancher. Originally from Pennsylvania, Charles lived with his wife Celia, who was from Ohio, and two children, one of whom worked as a farmer. This residence is significant as an excellent example of Folk Victorian architectural style with Neoclassical elements. Dating from the end of the nineteenth century, Victorian-era architecture combines innovative construction techniques, such as balloon framing, manufactured nails, and standardized component parts shipped to the construction site by rail with a romanticized image of the “picturesque.” Resulting houses constructed in this period incorporated asymmetrical plans that related to the interior flow of spaces and flamboyant exterior decoration. Transitional styles, like Neoclassical, represent the transition from the Victorian-era styles of the late 1800s to the Craftsman style of the early 1900s and often individual buildings will incorporate less elaborate elements of both styles. Local designation date is July 7, 2015. It is designated as landmark #74. As of the date of local designation there was no Mills Act Agreement connected to this property.